Michael Landsberg is one of the most well-known personalities in Canadian broadcasting. He hosted Off The Record on TSN from 1997 to 2015 and over 5,000 episodes of TSN’s SportsDesk. Landsberg is also a mental health advocate. 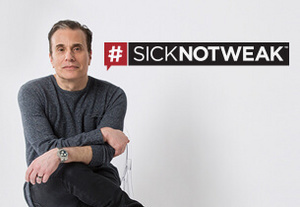 He’s spoken openly about his battle with depression since 2009 and his website, #sicknotweak is an open forum for those battling depression; a way to help both sufferers and the people who care about them. I recently had the honour and the privilege to speak with him on about his amazing work in the field of mental health, a subject something that hits very close to home. The GM’s Perspective: Mr. Landsberg, people know you from your immensely popular TSN Network show (Off The Record) and your years on Sportscentre, but some may not be familiar with your battle with anxiety and depression. What made you so open and honest about your struggles and the want to bring it to the forefront? Michael Landsberg: I’m open and honest about it because I’m an open and honest person. I wear who I am on my sleeve. I’m exactly what you see; the same person on camera and off camera and same person with family and with friends. So it stands to reason that I wouldn’t walk around with a secret. My self-esteem was given to me by my parents. The feeling of self-worth, even though it’s compromised by the illness, gives me the confidence to say this is what I suffer from. I do not care what you think of me. I don’t care whether you think this is weakness. I know what it is and therefore, I am more than willing to share. GMs: What’s it like now being able to talk about it in public? ML: I never had a weight on my shoulder. When I first started the struggle, in say the year 2000, people knew. I told my friends, I told people I worked with, and I told my family. Even though I wasn’t public about it, it was never a secret. I never felt like I had to live a secret life. It wasn’t until I spoke about it for the first time in 2009 that I found out that, not only do people care, but that there’s a huge value to it. I was shocked that it impacted people just by hearing me talk about it. GMs: #sicknotweak What an amazing phrase for your website! Personally, I’ve dealt with anxiety and depression for over 20 years and just now am being relatively open and honest about it. 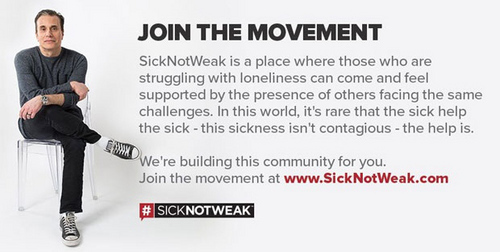 What is #sicknotweak and what can people learn from it? ML: The most useful thing I say is always going to be the first thing I say. What I’m gonna say first, and this is usually how I start a speech, is my name is Michael Landsberg. I suffer from mental health challenges. I suffer from depression, I suffer from anxiety. I’m on medication and I’ll be on medication for the rest of my life. Depression has taken me down. Depression has taken years off my life. Depression has robbed me of my confidence, but I am not embarrassed, I am not ashamed, and I sure as hell am not weak. So when I talk about what is “#sicknotweak”, it really is a statement. I am sick not weak. You are sick not weak. The person that you care about that is struggling with a mental health problem, they are sick not weak. The stigma would disappear if people understood that. It’s because mental illness is perceived as being different than a physical illness. Somehow we believe that it’s self-inflicted. What is #sicknotweak? It’s a statement. It’s an initiative. I think to some extent, and I don’t want to overly dramatize it, but it’s a revolution because people have been silent for so long. People die because of the silence. People hide because of the silence. If you don’t go for help, you’ll never get better. The tragedy is people don’t go for help because they see themselves as being weak. GMs: The stigma with mental health, and men, and sports, and trying to be tough and push through whatever because that’s what you’re supposed to do is still prevalent. But earlier this year we saw Roberto Osuna, closer for the Toronto Blue Jays, go public about his off-field anxiety… Are we at a point now, where someone, an athlete in particular, can be open and honest to the people signing the cheques? ML: I think we’re better than we were. I don’t think that could ever have happen 5 or even 10 years ago. And certainly 25 years ago would be unheard of. But just from talking to players in different environments, I still think there’s a long way to go. Speaking with Dirk Hayhurst, who pitched for the Blue Jays and now works for TSN and is on my radio show I host fairly regularly, has suffered from severe anxiety and depression as well. He said a million times that in the locker room people don’t talk about stuff like this. A lot of it relates to, not people on the outside not even to fans necessarily, but it’s the perception in the dressing room. It’s the fear of what are the other 24 players going to think or what the other 14 players in a NBA locker room going to think? There’s a long way to go, but it’s better than it was. GMs: As an advocate for mental health wellness, what’s your role in all of this? ML: First, my role is to lead by example. If I’m to share I’ll show no shame or embarrassment and have no hesitation to talk about my illness and what my illness does to me. The unspoken word in all of this is self-esteem. No one wants anyone else to believe they aren’t confident. When I say lead by example I mean candidly and openly share it. The first time I did that was in 2009 on Off The Record interviewing Stéphane Richer. I heard from 22 people the next day and 20 of them were men. All of them said that hearing two guys speaking on mental health challenges without shame or embarrassment, and without sounding weak, had empowered them to reach out to me. They told me, as the first person in their lives and first person they ever told this to, that they were willing to do that because they had heard me. My examples, which I didn’t even know was going to be impactful, changed those people’s lives. Second, it’s to try to instil the idea that this is a game of tag. I share with you and you share with someone else. The best #sicknotweak has to offer is empowering people to stand up to their illness, perhaps even stand up to their family/workplace and say I’m tired of feeling like I have something to be ashamed of. I’m tired of having to act. GMs: Does anything still surprise you? ML: It shocks me everyday when people reach out to me and say they heard me speaking or saw this or read that and it really helped them. That’s unbelievable. What a gift that is to be able to take the worst thing in my life and make it one of the best.